"A My-Life Christmas" keeps going, with no end in sight. This chapter was published in the Revere High School Lantern on November 17, 1993 (not only was this the first published addition to the storyline since Part Two, but this was also published right alongside Parts One and Two). In May 1994, this comic strip was re-published in a special Lantern compilation since the storyline won the Lantern's Best Comic of the 1993-1994 Year Award. Well, what can I say. I'm not too fond of this one, but at least it's published here unedited for the first time. 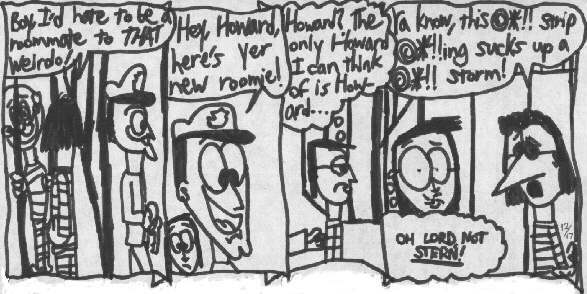 When it was being published in the Lantern, the people who were making the ink plates of the pages (one Andy Burkett and one Dan Prusak...punks) tampered with the strip's negative by adding "pupils" to Officer Karrots' eyes. Well, that being illegal and all, I was able to talk Barb Jentes of the Lantern into completely switching publishers (at the time, it was being done in-house for free...last I heard they were paying some place down the street to do it). Sneaky, aren't I?